Nancy López lives in a house made of clay, wood and corrugated metal sheets, on private land dedicated to agriculture. She is part of an indigenous community of 12 families in northern Argentina that, like almost all such communities, has no title to the land it occupies and lives under the constant threat of eviction. 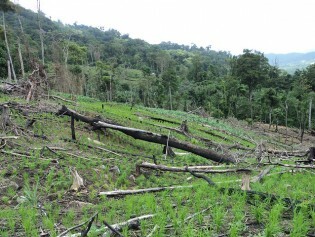 Two-thirds of the 33 countries of Latin America and the Caribbean have already submitted or are preparing to submit to the United Nations their land degradation goals, to combat a problem that threatens agriculture and the lives of their people. Jazziel Baca lives in the municipality of Esquías, in western Honduras, one of the areas hardest hit by the southern pine beetle (Dendroctonus frontalis), which damaged almost 500,000 hectares of forest in that Central American country between 2013 and 2015. According to the United Nations Food and Agriculture Organization (FAO), 31.1 percent or about 337,000 hectares of Jamaica is forested. Of this, 26.1 percent or 88,000 is classified as primary forest, the most biodiverse and carbon-dense form of forest. Mountain communities in the Himalayan region are almost entirely dependent on forests for firewood even though this practice has been identified as one of the most significant causes of forest decline and a major source of indoor air pollution. In the northern Brazilian state of Pará, the construction of a port terminal for shipping soy out of the Amazon region has displaced thousands of small farmers from their land, which is now dedicated to monoculture. Liberian President Ellen Johnson Sirleaf recently affirmed her commitment to the land rights of Liberia’s local communities, who rely on the forests for their livelihoods and have cared for them for generations. Following growing concerns in the United States about the risks of trans fat since 1999, demand for palm oil, a cheap substitute for trans fat, more than doubled over the last decade and is expected to increase, eliciting concerns about deforestation in several Southeast Asian countries that provide 85 percent of the world’s palm oil. For Jamaica, planting more trees as a way to build resilience is one of the highest priorities of the government's climate change action plan. So when Cockpit Country residents woke up to bulldozers in the protected area, they rallied to get answers from the authorities.